After popping into a LOFT and opening up a credit card as mentioned here, I made another big purchase on their site and I have to say that I am a really big fan of their ponte leggings. I love every single one I got, which were the Petite Ponte Five Pocket Leggings, Petite Faux Leather Leggings, and Petite Seamed Ponte Pants. The two main reasons I love them so much are that no alterations are needed (!) and the material is great. I also really liked this Petite Lattice Mixed Media Sweater, which was the only top I ended up keeping. I quickly popped into a LOFT last week to make returns and ended up leaving with a shirt (never-ending cycle!) because of their friendsgiving sale with 40% off everything, both online and in stores! Floral Button Back Swing Shell. I'm also wearing my new Petite Ponte Five Pocket Leggings here! 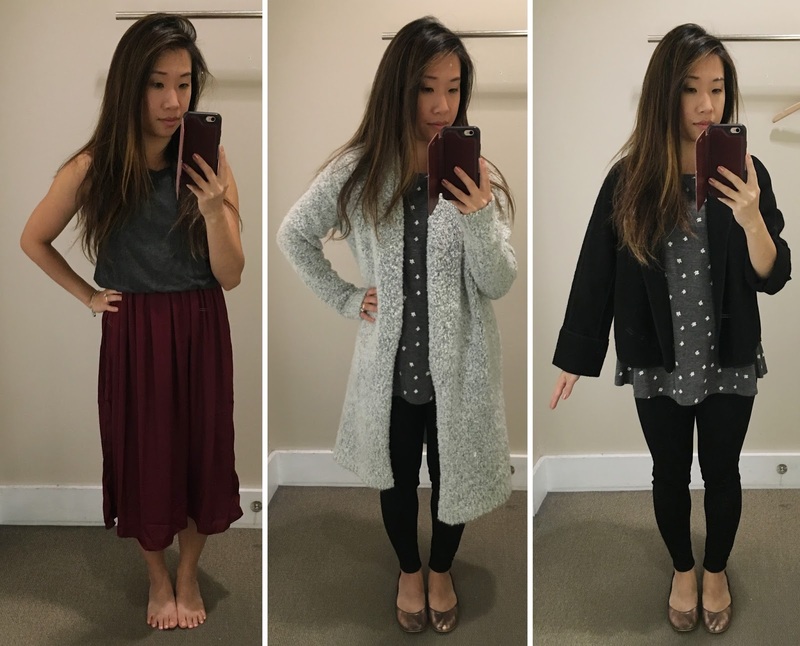 Petite Duet Dress, Lou & Grey Cloud Boucle Cardigan, Petite Tipped Wooly Jacket. I wasn't a fan of either of these items because they were all too big and the Tipped Wooly Jacket was also uncomfortably scratchy. 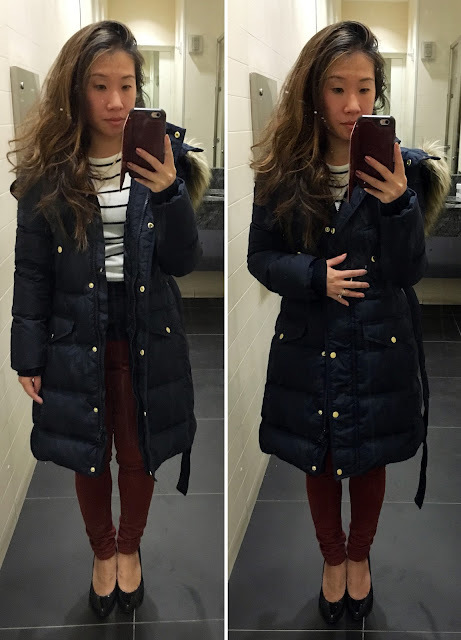 This very same day, I received my first package of a huge coat order I placed with J.Crew! I've been meaning to try out their XXSP and 000P size in outerwear since I had a bad experience with how their tops fit in that size, which was mind-mindbogglingly tiny because I could barely squeeze it on myself and it's very hard to find things that aren't too big for me. Anyway, I was pleasantly surprised to find that the Petite Wintress Puffer coat with Faux-Fur Hood fits nice and slim and looks great on but disappointingly, the sleeves were a bit short and the underarm area was extremely tight, which means I would have to size up but may not get as flattering a fit. Since I've recently purchased 2 black puffers over the years, I decided to pass on finding out, although I wouldn't hesitate to purchase this if I ever needed one! ***Edit: I just tried on the Navy version, which arrived a few days later, and for some reason, it fits fine in the arms and is not excruciatingly tight, which is confusing and also disappointing because the sizing is inconsistent across the colors. Left: Petite Wool Melton Military Coat with Faux-Fur Collar. 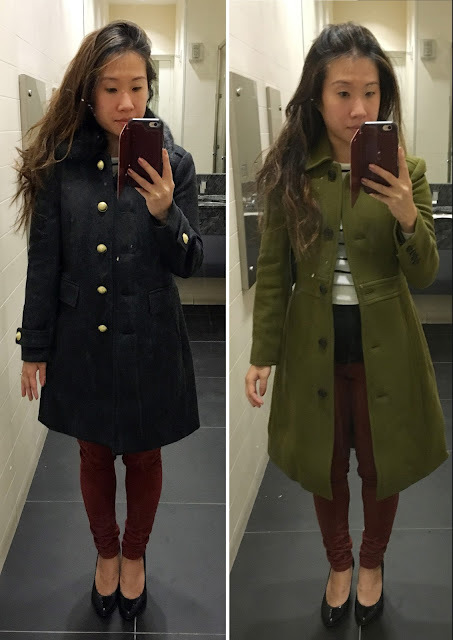 Right: Petite Double-Cloth Lady Day Coat with Thinsulate. Thanks you for amazing reviews for us petites! You look great in all those j crew coats! Im with you on your final coat choices. The military coat and the chateau parka look perfect o you! Now I am seriously considering buying either one of them. Does the chateau feel big like the reviews say? 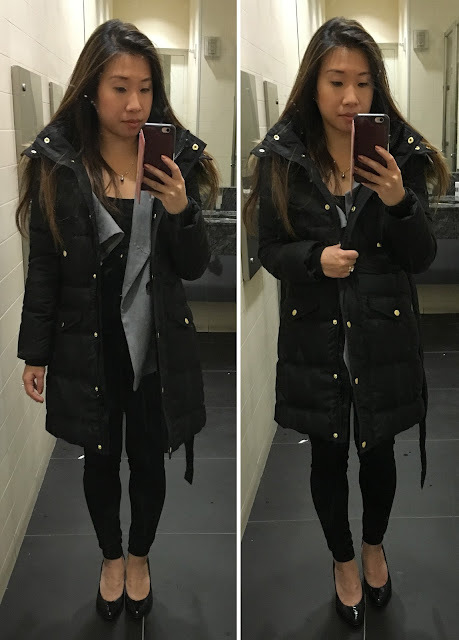 I am a real petite(4'8) and was really worried about the fit. Would you mind telling me your exact height and weight? It would help me so much!! Thank you Hailey! :) The chateau definitely does not feel big in the 000P that I have on but I can see where the comments come from because with a side view, it's a bit tent-like and it's also very A-line when buttoned up from the front (you can kind of tell in the pic above with it unzipped on the left and on the right, I have it overlapped more than it would be zipped by itself). 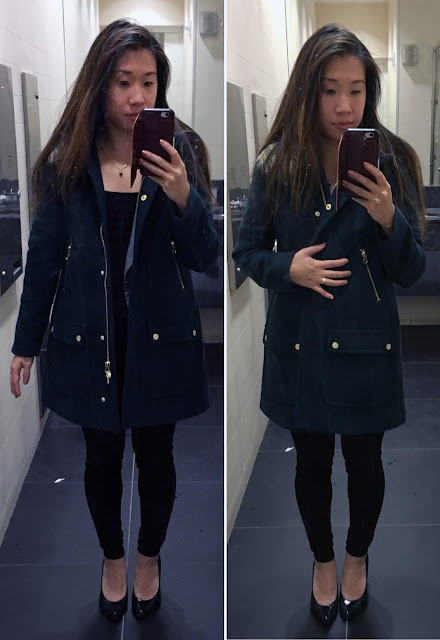 I actually also bought this coat in Black to compare and am deciding between the two colors (prob going with the Forest) but I'll take some more side views and front views of both colors and post them up tonight/tomorrow. I'm about 4' 10" and currently weigh around 96 lbs - hope this helps! Hi, Brietta. What are your measurements? the 000P lady day coat seems to fit you well, so I'm trying to determine if the same size would fit me. Thanks! Hi Kate! Sorry for the delay. My measurement from shoulder seam to wrist is ~20", underbust is ~27", and waist is ~27". Please let me know if you need any other measurements! The Lady Day Coat does fit very well but it is pretty snug and I wouldn't be able to fit a heavy sweater underneath. Hope this helps! Thank you! Sorry, 20 - 27 - 27 are your personal measurements, unclothed? Or are these the measurements of the coat? Sorry, just trying to understand because I personally have a 24-inch waist and also I'd love to know the measurements of your hips! Would help me get a better idea... from appearances, you and I seem to have the same measurements actually. Sorry I didn't mention! These are measurements of me with clothes on, not with the coat on - I always considered myself to have a 24" waist too because that's the size pants that I wear but I may have gained some weight recently... :) My hips are ~30.5" over pants. Thank you for sharing feedback re: coats! The annoying task of trying on and/or purchasing multiple options has been a hassle and I wanted info. 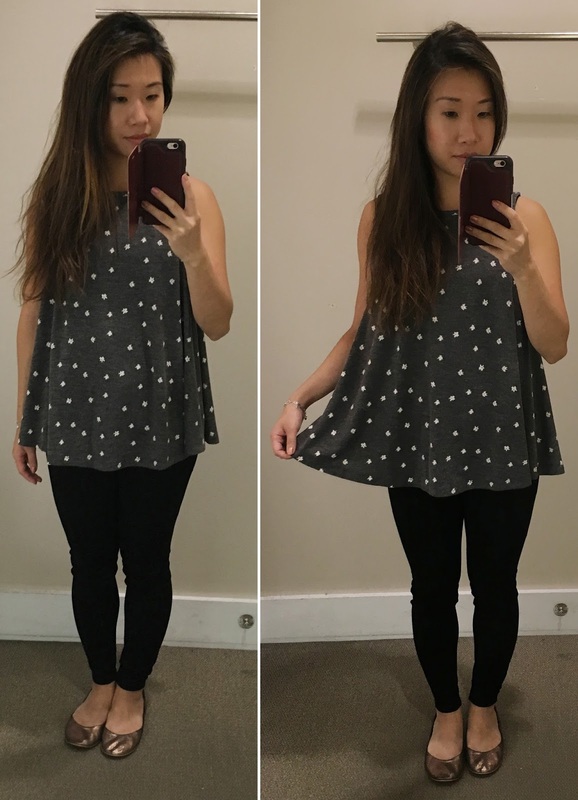 about J Crew Regular vs. Petite sizing. Do you happen to know the difference between the Regular 000 vs the Petite 000 in the Chateau Parka Stadium Cloth? I tried on the Regular 00 in store and everything was fine except for the arm length (it was a bit too long). I do not want to lose the length of the Regular fit and liked the fit so I purchased Regular 000 and wondered if Regular 000 would make the fit too snug. Would you recommend Petite 00 or Regular 000? Side note: I'm a little over 5' and do not usually purchase Petite since I like a longer/roomier feel. I also find that it suits my body type since I actually appear taller (due to my proportions). Plus I like an oversized look in general (and not fitted/tapered). Weekend Shopping + Apple Chips!